General Dwight D. (Ike)* Eisenhower was president when this article was written telling of plans for the Federal Communications Commission (FCC) to receive their first computers. Arguments had to be made to justify the expenditure based on how much money might be save to time save in completing the department's duties. Citizen Band (CB) radio license applications were being received at a rate of 10,000 per month, which was really beginning to cramp the processing efforts when combined with the FCC's other responsibilities. Mention of Ike always reminds me of the Happy Days episode with Fonzie saying, "I like Ike. My bike likes Ike." The electronic data processing bug has bitten the FCC. At the moment, chances look good that the Commission will be blipping out your Citizens Band licenses by machine in a few more years. 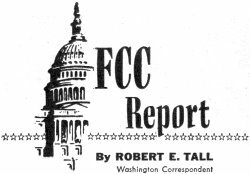 Studies are already being made by the National Bureau of Standards to see which parts of the FCC's activities can be fitted into computer operation, but it will probably take until early 1963 for the Commission to make the necessary decisions and get the program into full swing. Word on the computer plans was passed to the House Interstate & Foreign Commerce Communications Subcommittee when the Commission went up for its annual quizzing in connection with appropriations for the year starting July 1. Several of the Congressmen briefed on the plans expressed quick support. FCC Executive Officer Robert W. Cox told the subcommittee that both the Bureau of Standards and the Commission feel it is "premature" to say how much money can be saved or how much faster work can be done by a computerized operation. However, both agencies are "very optimistic" about the possibilities. The big question concerning the Citizens Band and other two-way radio fields administered by the FCC is not whether the machines can handle license processing, but whether they can do the work more economically. A decision as to whether or not to swing into a full data processing program will probably be made by the FCC this fall. If the agency goes the computer route, another complete overhauling of application and license forms is indicated. Chairman Albert Thomas (D., Tex.) of the House Subcommittee said the work of the FCC's Safety & Special Radio Services Bureau, which includes the Citizens Band activities, should fit into computer operation "just like it is made to order." If the program is undertaken, it very definitely should mean much quicker application processing. Citizens Band applications were being received by the FCC at a rate of more than 10,000 a month, and the FCC told the House members that since "an estimated 50 firms are making or planning to make the relatively inexpensive Citizens Band equipment, a steady rise in receipts can be expected as sales promotion plans get under way and competition results in lowered prices." The Congressmen sitting in on the sessions did not raise many questions when they were told that the Commission expects the Citizens Radio Service to grow to an estimated 200,000 licensees this year, and that the blossoming service has required enforcement action "leading to the issuance of at least 100 citations per month" for violations. The FCC asked for money for added enforcement personnel to handle problems involving class D licensees, which will "undoubtedly increase as the band becomes saturated." Individual CB enforcement cases continue to involve primarily off-frequency operation and failure to answer FCC violation notices. 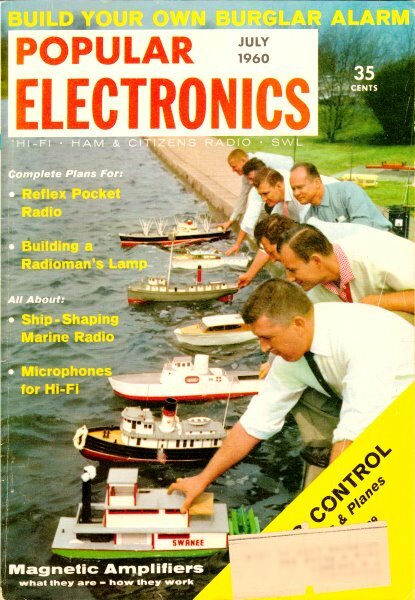 Amateur radio, meanwhile, got a large national publicity boost when a live broadcast account of the annual meeting of President Eisenhower's Committee on Employment of the Physically Handicapped was transmitted to physically handicapped and other radio enthusiasts throughout the world. Accounts of the May 5-6 meeting in Washington were put on the amateur airways by Miss Margaret Cauffield (W3UTR) and Gordon Walker. Miss Cauffield is a wheelchair-bound "ham" employed by the Office of Vocational Rehabilitation of the Department of Health, Education & Welfare; Mr. Walker is also confined to a wheelchair and is an electronics engineer with the Navy's Bureau of Ships. The station they used was loaned for the venture by a Washington electronics and radio parts firm. It was operated with a power of about 145 watts, with a 55' x 35' antenna supplied by the Naval Research Laboratory on the roof of the Departmental Auditorium in Washington where the meeting was held.